Raymond Briggs Father Christmas has become an iconic portrayal of the great man himself and if you haven’t seen this theatre show, you Bloomin’ better! Returning for it’s third year, the show is full of warmth, fun and giggles and perfect for families with young children. Father Christmas awakes from a dream of summer sun only to realise that it’s bloomin’ Christmas Eve and the start of his longest night of the year. He gathers the reindeer and prepares his sleigh, beginning the long journey into the snowy night to deliver presents to sleeping children all over the world. But things don’t run smoothly and he soon encounters soot covered chimneys to squeeze through and treacherous weather conditions, all while plenty of mischief is had by his cheeky pets, Cat and Dog. Winter Sun is a ‘hearth’-like artwork inspired by our need for light in the darkness of winter. Winter Sun offers a place to gather together in a temporary structure of ever-changing light. With various free events throughout December, choose from Shadow Shapes this Saturday 2.30pm – 4.30pm where you can go and create shadow shapes and experiment with your creations making shadow plays in the sunlight or pop along on Monday 22nd December and make a mirror ball to reflect winter light, hang on your tree or have your own mini disco. A seasonal themed planetarium show explores the latest ideas about what the Christmas Star might have been as well discovering what the night sky has to offer over the Christmas period and beyond, including the Moon, planets, stars and constellations, presented live by a Royal Observatory astronomer. As you’re in Greenwich Park, why not walk down and visit the National Maritime Museum, it’s free, or pop along and see the deer. Still have Christmas shopping to do? Head towards the Cutty Sark and visit Greenwich Market – there are some great food stalls too if you’re feeling a bit peckish. Visit St James Theatre this Christmas for storytelling, comedy and songs that create a magical and mysterious world. Billy has everything a young goat could need – and more besides. On New Year’s Eve, Billy’s parents tell him about the legendary Snow Dragon, who will bring him even more goodies during the night. But when Billy bumps into some wolves in the woods, New Year’s Day seems a long way off. Enjoy finding out how Billy escapes – and whether the Snow Dragon will bring him a present. Has Billy been naughty or nice? From the company that produced The Gruffalo and The Snail and the Whale, this is a Tall Stories production. Depending on whether you want to make a day of it, St James Park isn’t far and the Changing of the Guard takes place daily at 11am (10am on Sundays) and lasts about 30 minutes. It’s held on Horse Guards Parade by Whitehall, which is located east of St James’s Park and don’t forget the Pelicans – St James Park residents since 1664. What could be more Christmassy than a retelling of Charles Dickens A Christmas Carol. A Christmas Carol is brought to life through shadow puppetry and captivating physical theatre. Enjoy lesser known Dickens Christmas Stories too as live actors with an identifiable and unique style of movement, create an atmosphere that entices you into an enchanting world. Witness a teacup turn into Tiny Tim and transformations from ghostly spirits to the miserly Scrooge with the flick of a top hat and the click of a cane. It simply has to be seen to be believed! For a breathe of fresh air and to let the kids run wild before sitting to watch a show, enjoy the fabulous Coram Fields – with playgrounds, a city farm and a cafe too plus a large adventure play area including an aerial slide. Robert Louis Stevenson’s story of murder, money and mutiny is brought to life on the Olivier stage at the National this Winter. . Treasure Island is the classic tale of pirates and hidden treasure, ‘Long John’ Silver and maps plus the infamous parrot of course. We’re walking in the air…OK not quite, but as near as possible. This Christmas you can join The Snowman and The Snowdog on Emirates Air Line. The Snowman’s flight will be brought to life using immersive digital effects, including specially edited sequences of the film and soundtrack will be combined with new aerial footage of the cable car and its surrounding landmarks – treated to create wintery animation effects and featuring the film’s characters. You can also take your own photos with a life-sized Snowman model before boarding your flight. And, we’re told, there are 15,000 free goodie bags for children – given away on a first come, first served basis containing a Snowman chocolate, in-flight binoculars, an i-spy challenge and a Snowman or Snowdog character mask. Cost: For the full experience, Adults £10, Children £6. Note though that if you’re an Oyster Card holder get a discount on all online fares. Save £2.20 on the adult experience and £1.20 on the child experience. Finding it difficult to persuade the kids Christmas shopping is fun? This promised immersive experience might make them change their minds. Let the kids take a different kind of adventure this Christmas and discover the secrets inside The Hidden House. Inspired by the Grimm Tales, investigate the sudden disappearance of Red Riding Hood. Set in a free-flow maze, the kids get to journey through the different rooms of The Hidden House and uncover storytellers, princesses and fairy tale surprises in a high-tech environment. The kids mission, should they wish to accept, is to rescue Red Riding Hood….. There are two experiences; The Hidden House for 8+ and The Hidden House (11am – 5pm): Darkest Secrets for 12+ (5pm – 10pm), for those who enjoy being scared. There’s something for everyone at Westfield with a Santa’s Grotto for the younger members of your family and Playworld – specially-designed play area for under 5s. Age: 8+ and accompanying adults aren’t required. Cost: Free Entry with tickets required for the various attractions including ice rink, spiegeltent, roller disco, fairground, Ferris Wheel and Wall of Death and Horse Carriages. 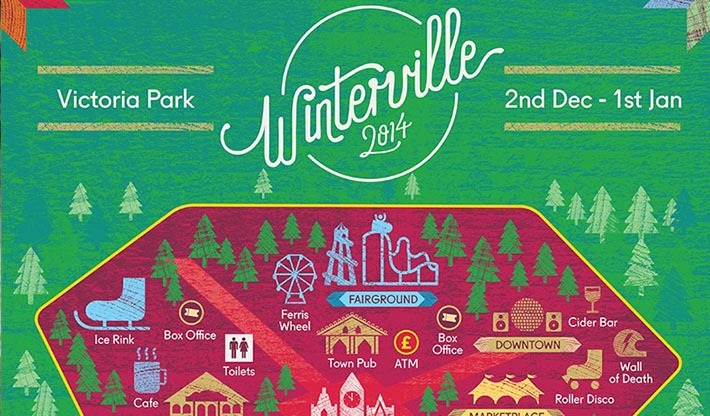 Southbank Centre’s Winter Festival – Christmas Tree Maze, Southbank Centre Express & more! As part of the Southbank Centre Winter Festival, prepare to get lost in their magical maze! Built from 300 Christmas trees, find your way to the middle and children will receive a gift. Been lost and found and need a sit down, jump on board the Southbank Centre Express. The train journeys from Hungerford Bridge to Festival Pier and back again providing the perfect opportunity for you to take in the sights, sounds and smells of this years Southbank Centre’s festive makeover. 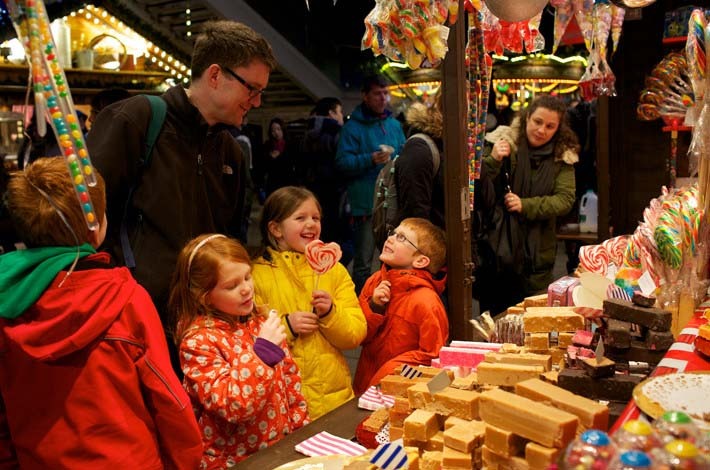 The spectacular array of events, activities and outdoor art plus festive markets, make the Southbank Centre a must this Christmas.